Pipe Flow 3D is a professional tool that calculates pressure losses in pipe work systems with non-compressible fluid flow. 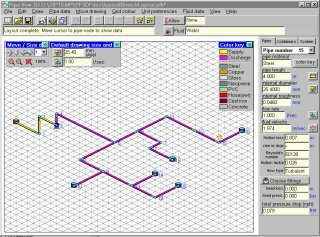 ■ The Pipe Work System can be designed by drawing on the ‘3D’ grid. ■ PipeFlow 3D makes Pressure Drop Calculations easy. The fluid velocity, viscosity and density is used to calculate the Reynold’s number. The roughness of the inside of the pipe and the internal pipe diameter is used to calculate the ‘relative roughness’ of the pipe. The Reynold’s number and ‘relative roughness’ are used to establish the friction factor and the flow type.